The mic was developed in 1990 by Dr. Günther Theile, of the Institut für Rundfunktechnik GmbH (Munich’s IRT, the Broadcast Technology Institute). 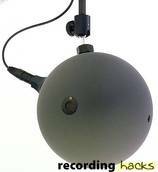 [The] sphere microphone produces stereophonic signals which are composed of natural interaural differences, quite similar to dummy-head signals… [However,] the sphere-microphone signal does not contain those dummy-head-specific spectral cues, which are used for front-back orientation during headphone listening, but which are not used during loudspeaker presentation and would therefore cause coloration problems. As with a dummy head, the spherical KFM 6 body acts as an acoustic baffle, altering the pickup pattern and frequency response of the two omnidirectional (pressure) transducers mounted on its surface. The microphone capsules are modified versions of Schoeps’ “Colette” series, using gold-plated 13mm Mylar diaphragms within a 20mm housing. The capsules are mounted more than 180° apart; their combined output produces a stereo image 90° wide. The capsules and internal electronics were engineered to produce an “essentially flat” response, both on-axis and off. The output level of the two capsules (summed) is consistent as a source moves around the sphere. Directionality is consistent across the frequency spectrum. An LED is built into the mic housing, midway between the mic capsules, to aid in positioning the mic — even at a distance. A foam windscreen and wooden storage case are available separately. The mic was released in 1990. Frequency Response - BinauralClick Graph to Compare!